Most of us are pretty social creatures, so it's perhaps no surprise that social networks have grown to become one of the dominant platforms of the modern web - most of us get news, companionship, entertainment and more from the likes of Facebook and Twitter. And while those sites and apps (together with Snapchat, Instagram and the other well-known ones) might dominate in terms of coverage and user numbers, there are plenty of smaller, niche networks out there. Here are some of our favourites. There's nothing particularly innovative about Peach, but it's got early adopters in Silicon Valley buzzing, which may or may not be a good sign. What gives Peach its cool factor is its flexibility, and it combines various different aspects of Facebook, WhatsApp and Twitter into a colorful, free-flowing whole. It also ditches the idea of a news feed in favour of a more fleeting, less permanent approach. Ello hasn't quite lived up to the hype surrounding its launch, but there's still a lot going for it - it's recently been positioning itself as a "creators' network" where you can promote your artistic urges free from the corporate machinations and advertising of Facebook. You can dive in and take a peek without having to sign up for an account, and the interface is clean and straightforward to use. Beme is built around the idea of instant, unpolished video sharing, as you might expect given it's been created by YouTube legend and power user Casey Neistat. Don't fret about how amateur your footage looks - just get it up there for your friends to see. If you think that sounds a lot like Snapchat video, you'd be right, and Beme clips are designed to disappear after you've seen them too. Yik Yak is the place to go for random, anonymous messages from near your location. At first that sounds rather pointless, but think schools, colleges, music festivals, offices and more - places where you're with people in a community and can tap into conversations much more easily than on Facebook. Of course, if there are no other users in your area, it can get pretty lonely on Yik Yak. Social activities don't get much more social than having a beer, so here's Untappd, a mobile social network based around bars and beers. You can use the apps to share where you've having a drink, and what you're drinking, and discover new places and tipples in return (useful if you need recommendations in a new town). There are plenty of activity 'rewards' to unlock as well. There's slightly more chance that you've heard of Path than some of the other networks on this list, because it has gathered a certain level of attention since it launched in 2010. The philosophy underpinning Path is that you focus on quality not quantity: there's a limit on the number of friends you can add on the service, and the apps are built for some personal and private sharing. 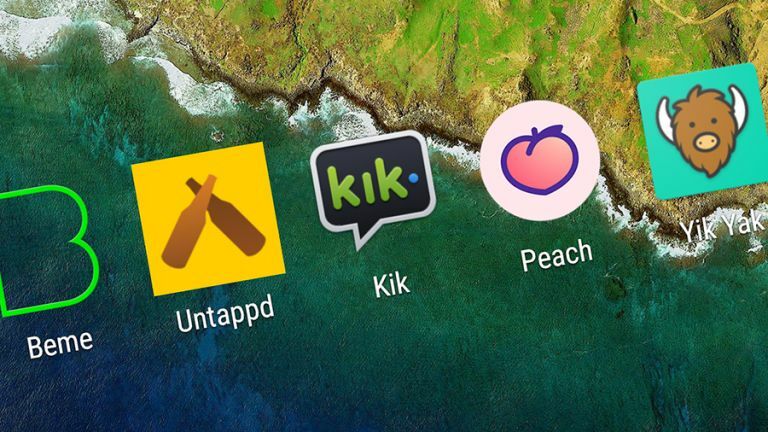 Although Kik doesn't have the same kind of profile as something like WhatsApp or Facebook Messenger, it does have many of the same features - you can get chatting very easily, and there are all the usual features you would expect to find in an app like this, such as support for GIFs and stickers as well as group messaging. With over 100m installs, it must be doing something right. The rather oddly capitalised ASKfm isn't exactly a small social network - 150 million users and counting - but it may well have flown under your radar. The premise is that you use it to ask questions and provide answers, which turns out to be a rather effective way of interacting with your friends and random strangers on the internet. Watch out for the trolls if you give it a try. Again, Oovoo isn't a particularly small social network, but its popularity is limited to certain parts of the world, which means you may not have come across it. The main features here are related to video chatting, whether that's one-on-one with your best pal or in a group with your tribe of friends (or family). There's also a texting component so you don't have to take the video route. Go full on Edward Snowden with Telegram, an app that puts security above all else - encryption before emojis. You can use the messaging app on just about every platform out there, and through your web browser, and it comes with bonus extras such as self-destructing messages and document transfers. What's more, there are no ads and no subscription fees to use the service.